Posted on December 31, 2008 at 7:52 pm. One of my favorite verses to think about as the New Year arrives is Psalm 65:11 which says, “You crown the year with Your goodness, And Your paths drip with abundance.” May you glorify God this year like never before as you live to make Jesus famous with every breath! I had a lot of fun snowboarding this morning and even had a chance to share the gospel with a couple teenagers from Canada on a chairlift. I’m praying that the seeds that were planted will lead to salvation. I invited them to church on Sunday but they will be heading home Friday. I told them they could listen to the messages on iTunes and they were genuinely surprised by that. One of them told me they just got a new iPod Touch for Christmas and would be into checking out the fresh life podcast on it. I pray that they will. I have heard many stories about how God has used His Word as it goes out to in the language and format used by a tech-savvy culture. I love the thought of one day running into those two dudes in heaven and being stoked I had the chance to spend a ride up the hill with them. I may never see them on the earth again but you never know what God can do with a simple conversation about Christ. Posted on December 26, 2008 at 2:48 pm. I hope you all had a Merry Christmas and are relaxing and hanging out with family. 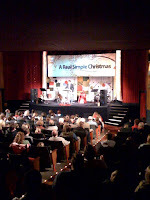 We had a wonderful celebration of Jesus’ birth at fresh life on Christmas Eve. We had three services and all together 900 people plus kiddos came out to worship and hear the Christmas story from God’s Word. Singing the Christmas carols was awesome, and our worship team did a killer job. I gave a message called A Real Simple Christmas, and we talked about how even though out of necessity this may have been a lighter gift giving holiday than normal that didn’t have to jeopardize how special it was. In fact, having a scaled-back, simple Christmas could potentially be the secret to a more significant celebration than ever before. Whatever the case, what is vitally important we don’t let Jesus ‘t get lost in the commercial clutter of the season. And whether there were few gifts under your tree or many–the biggest gift of all is that Jesus was born to die on the tree! At the services there were a number of people who responded to the invitation as the gospel was presented. Now that’s what I call a Christmas miracle! Some people are spontaneous and organic with Christmas activities, my family has some traditions that I would never want to shake. It all starts on the night my wife and I wrap gifts–after the girls have gone to bed, we work as we watch the first disc of Jesus of Nazareth. It was made in the 70’s and stars Robert Powell as Jesus and James Earl Jones as one of the wise men. It is super old school but my dad always had it on and when I moved out he bought me my own copy. (The second disc gets watched at Easter time–but that is another story altogether.) Christmas morning we wake up as late as the girls will let us and open our stockings then we have coffee and cinnamon rolls which has been baking/brewing while the stockings are opened. Before opening presents we read the story of Jesus’ birth and thank God for coming to this earth to save us. We open presents one at a time after that–Jennie tries to save bows and ribbon–but I do my best to tear my gifts open as quickly as possible and most paper is ripped to shreds! After gifts we have a big breakfast which is more like brunch by that point. And the rest of the day is lazy and wonderful. 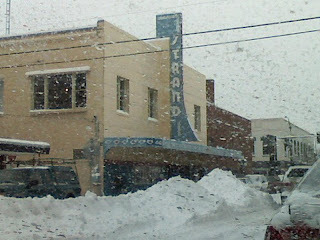 What only added to the charm yesterday was the snow that kept falling all day long. This morning I woke up to find we had received an entire foot over night. I am pretty sure the mountain is calling my name and if I can talk myself in to getting up and getting my snowboard out I will answer. Merry Christmas! I’m thinking…it will be a white Christmas! Posted on December 23, 2008 at 2:31 pm. Here is a picture that was sent in to our fresh life photo cast during the wild week of white. The center dividing yellow line was replaced by snowdrifts left by the snow plows as they clear the streets. These snowbanks were all over town making the city look like a kids snow fort. I love it. What I wasn’t expecting was how cold it got on Saturday night. I had to check several different weather services to make sure my phone’s weather app wasn’t acting crazy–I had to take a screen shot just to prove how cold it was. -22! Even though it was eleven at night I put a jacket on and went outside so I could say I had experienced such cold weather–the funny thing was that it felt the same as when it was 0 degrees outside. I guess after a certain point it’s just cold, just really, really cold. I will say that if there is any wind at all it is much, much worse. Even a 5 or 10 degree day can feel worse than sub-zero temperatures if there is a wind chill. I am sure that readers in California or Florida are probably wondering how any human could live in this and thanking God for where they live. I will say that I would have thought the same two years ago, but honestly you adjust and learn to dress for the weather and it is not as bad as you would think. I hope you all have gotten your Christmas shopping done, and can just enjoy the next day and a half without any trips to the mall. If you haven’t–good luck! I did 75 percent of my Christmas shopping online 2 months ago and have picked off the last remaining gifts in the last couple days. Above all things I hope you truly enjoy this special season with your family and as you celebrate the love of a God who would put skin on and walk among us so that we could walk with Him in unbroken fellowship and love. I probably have a few people in my church who think that I am an Ebenezer Scrooge sympathizer after I plowed on in Revelation this weekend instead of giving a Christmas message. It probably didn’t help that our text (Revelation 3:14-22) was Jesus’ letter to the church at Laodicea where he tells them because they are lukewarm He will vomit them out of His mouth. I called my message, “The Church That Makes God Gag.” After announcing that title, I knew I had better give some explanation–here is how I put it. But let’s think about it for a minute. Christmas is the day where we celebrate Jesus’ Birthday right? And if there was possibly something going on in our church, or in your life that made Him sick, what would make Him happier? To tell warm fuzzy stories about His birth? Or to deal with the problem so He was no longer nauseous? I suggest we go on with our study and then we can properly enjoy His birthday celebration on Christmas Eve! Well, however harsh it may have seemed–the text does contain one of the most beautiful verses in all of the Bible, Revelation 3:20 which says, “Behold, I stand at the door and knock. If anyone hears My voice and opens the door, I will come in to him and dine with him, and he with Me.” At the end of the service I pointed out that all of us have no doubt been preoccupied with making sure we get the right gifts for our loved ones–but that we shouldn’t forget about Jesus on His birthday. What do you give a God whose got everything? Of all things, if you haven’t yet, you should give Him your heart! At our weekend services 6 people including a husband and wife made public decisions to open the door of their lives to Jesus Christ. It was awesome. And don’t worry–tomorrow night at our Christmas Eve service I will be talking about shepherds, angels and definitely Christ Jesus, the Lord! Posted on December 18, 2008 at 2:29 pm. Having a shepherd showing up to a midweek Bible study would probably be out of the ordinary at most churches, but I have a feeling that in Montana it happens a great deal more often than in other places! We were very blessed, however, to have a shepherd show up at church last night who told us a very special story–The Most Special Story–God’s story. A good friend of mine from Southern California, Pastor Bill Welsh, has a unique way of telling the Christmas story in a way that truly brings it to life. He calls it, The Shepherd of Bethlehem, and he has been doing presentations of it for over 20 years. What I love about it is that even though it is a powerful telling of the Christmas story–it doesn’t end there. It goes on and tells the rest of Jesus’ story, His flight to Egypt, Herod’s murder of the babies, Jesus’ ministry and ultimately His death and resurrection. This is so important because Bethlehem’s manger is powerless without Calvary’s cross. Many people love the feel good nature of Christmas but prefer to leave Jesus as a little baby and not have to deal with Him as a grownup. While we should be stoked on the fact that God put skin on and became a baby we mustn’t lose sight of the reason He came–to die for the sins of the world and reunite us with His Father. Even crazier still is the fact that many have divorced Jesus from Christmas entirely–effectively enjoying His birthday party but leaving Him outside. This Sunday at Fresh Life we are going to see a church that did just that–in contrast to the church at Philadelphia who had walked through the doors of opportunity that Jesus gave them the church at Laodicea had left Jesus knocking at the door of their church! While Bill was in town from Huntington Beach, where he lives and pastors, he snapped a shot of a statue of Jesus that illustrates this quite vividly. For what the church at Laodicea had done was what many still do–leave Jesus out in the cold. When he emailed me this picture of a statue of the crucified Christ covered in snow I was studying for Sunday’s message and it just made me sad to think of people embracing the baby Jesus but neglecting the cross. Or a church carrying on it’s activity and ministry but closing their door to Christ. What’s amazing to me is that He could clearly kick down the door and come in anyway. He is not powerless or weak, He has all the power in the world coursing through His veins but chooses to stand at the door and knock. Surely this Christmas, or any time for that matter, the best thing anyone can do is to open the door and let Him in! If you missed the service you can watch it online or grab the podcast. I’m trying to stay warm while writing as it’s fully winter here in Montana. Snow is falling outside and last night some of our pipes froze at the church. I called this blog, better fresh than frozen, but it seems that right now my ministry is both fresh and frozen! Many blessings. Posted on December 17, 2008 at 5:15 pm. Posted on December 16, 2008 at 12:08 am. Posted on December 13, 2008 at 1:21 pm. Lenya was discharged from the hospital and we are so thankful. Her doctors and surgeons said she was doing great and made more than enough progress to be sent home. Here is a picture I took on my phone while she was all wired up. It definitely is a relief to be out of the hospital, but now the challenge is going to be getting home with this crazy winter storm that has moved in since we arrived in Washington. Posted on December 11, 2008 at 4:15 pm. Our youngest daughter, Lenya, went under anesthesia today for a minor operation that had been scheduled several months ago and so her digestive system could be scoped to see if there was any damage from allergic reactions that she has experienced. Everything went well and she is groggy but coming back to consciousness slowly. She will be kept in the hospital for a day or two so they can make sure there were no complications. Please keep her in your prayers. It’s one thing to go under the knife, I experienced that this year, but to see your child go through it–it’s much, much different. Praise the Lord the procedure went as planned and the results came back looking good. Hopefully, having identified her allergens we can just avoid them and she won’t have to go through any more gnarly medical stuff. I am so very thankful for the access the Lord has given us to medical treatment. 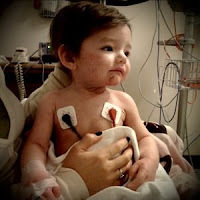 We have received great care at the children’s hospital in Spokane, Washington and have been blessed with great doctors and nurses each time we have been seen here. Thanks for your continued prayers for our little Lenya! Posted on December 10, 2008 at 9:21 am. As someone who regularly communicates truth to others I am aware of the great importance of regularly listening to truth being spoken into my life from others. I am so thankful for podcasts because they allow me to easily listen to other Pastors teach the Scriptures. Just about every morning of the week I make the rounds through the half dozen podcasts I subscribe to and enjoy their study as I eat breakfast. I am by nature an early riser and love the stillness of the morning hanging out, even though it is digitally, with these men of God. This morning the message I got caught up on was from the pulpit ministry of Alistair Begg. He is from Scotland originally, which is definitely a plus in my book. I have had the pleasure of visiting that country a number of times and really dig everything about it (maybe not everything, I didn’t enjoy the haggis too much–I might have enjoyed it more if I hadn’t known what it was before eating it.) His thick Glasgow accent still betrays his homeland even after pastoring in the United States for 30 years. It gives his Bible Studies a unique charm, but far more than just being charming, his studies are deep, sound and anchored in the solid bedrock of God’s Word. Today the study on his Truth for Life podcast was on how we tend to view the “Grass as always being greener” and he pointed out how just about everything in our credit-card driven culture feeds our covetousness. It was a killer message. Posted on December 7, 2008 at 12:51 am. There are a lot of things I love about living in Montana. Some of my favorites have to do with holidays. Take the 4th of July for instance. In other places I have lived, the fireworks are underwhelming, but in Montana they are just plain out of control. You can buy stuff that you would watch professionals shoot in California. (Whether that is safe or not is perhaps up for debate.) This past summer I had so much fun shooting fireworks with my friend, Christopher Laurie and his family, who were in town for the holiday. I came across some pictures of this a few days ago and was reminded of how much fun we had. Christopher went to heaven 20 days later and that trip was the last time I saw him on the earth. He is now experiencing fullness of joy in heaven with His Savior, Jesus Christ. His wife gave birth to their second baby on the day before Thanksgiving last week and I encourage you to keep little Lucy Christopher and all the Laurie’s in prayer! Thanksgiving is also a very fun holiday in Montana especially when you get to see wild turkeys on the side of the road, and that’s not to say anything about the turkeys driving cars on the road–but that’s a whole different story. But my very favorite has been celebrating Christmas in a place that is very much a winter wonderland. It snowed on and off the past 24 hours and is supposed to continue snowing this whole week. Fortunately we have our snow tires on and are ready to drive a little more slowly. (Especially with the vigilant law enforcement we have patrolling the streets!) I really do love this weather, it reminds me of my childhood growing up in Colorado. For the second year in a row we went out into the woods and cut down our Christmas tree. So much fun. A whole lot better than picking up one in the Ho-Ho-Ho Christmas tree lot next to the beach in Dana Point while it’s 70 degrees outside. It’s not that I don’t love California, I do. But Christmas trees just make more sense in their natural habitat. I was also proud to hear that the 78 foot tall Christmas tree that will be in the US Capitol, this year, was cut down in Montana. We weren’t quite so ambitious, but settled for a nice 7 footer that is all lit up and decorated as I type this in front of the fire while Frank Sinatra’s Christmas album plays. Jennie and Alivia made sugar cookies tonight but when I reached for a third one Alivia let me know I had already had enough! What a wonderful way to unwind from a full day of studying and teaching at our Saturday night service. 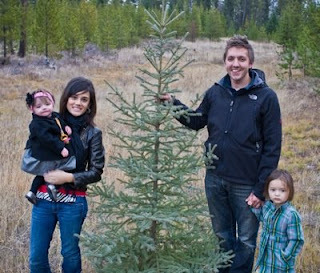 Two more to go tomorrow, so I better not stay up too late, but here is a picture of us with our tree. I hope you have a wonderful Christmas season celebrating our Lord and Savior, Jesus Christ. Leave a comment and let me know about your favorite Christmas tradition.